The stunning house was once home to the King of Rock n' Roll. Source: Getty. Out of the many things left behind by the late and great Elvis Presley, one of the most memorable is his 10,000 square foot custom mansion that he purchased at the ripe age of 22. Graceland is the iconic Colonial Revival house that sits on top a massive 13-acre farmland in southern Memphis. In 1957, Elvis bought the house and spent over half a million dollars customising it to suit his unique taste. It was the very home where Elvis and his family grew up, with his daughter, Lisa Marie Presley inheriting the estate at the age of 23, only a year older than her father was when he first bought it. The incredible house boasts features like a racquetball court, a swimming pool and a wrought-iron fence that famously resembles a sheet of music. 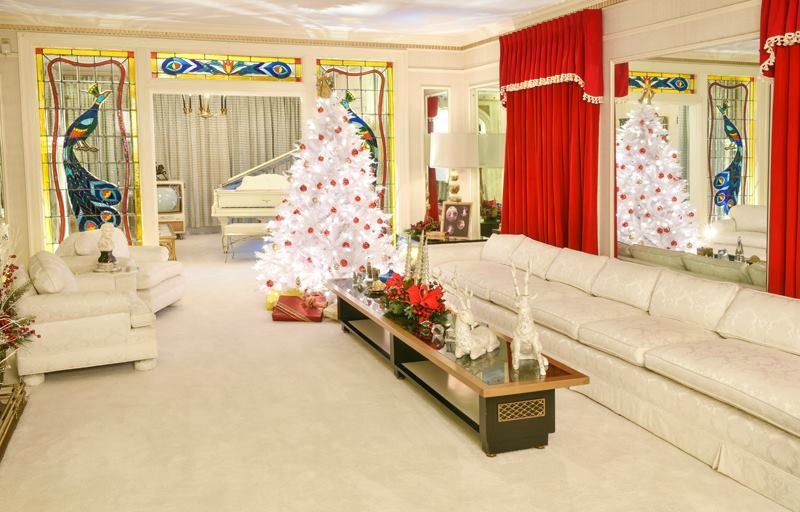 At the time, critics saw the flashy house decorated with crystal decanters, stained glass framing the doorway, and a vast array of Polynesian themed furniture and complained Elvis was too vulgar and gaudy for his young age. However, seeing the lavish interior of Graceland today, is simply one of the greatest reminders of Elvis’ genius. The Jungle Room is one of the most famous areas of the magnificent house. The unusually decorated den is complete with an indoor waterfall cut from stone, avocado coloured shag carpets everywhere you turn, and exotically carved wood pieces. This room quickly became a Presley favourite as it reminded Elvis and his family of Hawaii, where the singer and actor loved to vacation often. The home is now a museum, open for tourists and fans to explore every inch including the outlandish 1970’s interior design, the massive trophy building drenched in personal mementos, and of course the meditation garden. This peaceful, outdoor mediation area is where Elvis and members of his family have now been laid to rest. People from all over the world have come to pay their respects to the legend himself at the very place he passed. Since its official opening to the public in 1982, the famous home has seen over 20 million people walk through its doors. With the mansion becoming more and more enticing each year, the iconic destination will forever be a must-see for any die hard Elvis fan. Do you remember Graceland? Would you want to go there one day?